Are you giving any thought to using radiant heat. If you are great! If not; why not? Radiant heat is fast becoming a leader in the heating industry. One question that is asked all the time is should I be considering radiant as a primary heat source? The answer will depend on several considerations. Is your current heat source hot air, hydronic or electric? Where are you considering using the radiant? What will be installed over the radiant? When most people think of this type of heat, they think of bathroom and kitchen tile floors. But radiant has many other uses as well. It can be used under other types of flooring as well as stone tub decks and shower walls for additional comfort. Since radiant heats objects and not spaces and heat rises, radiant can be a wonderful primary heat source if you are starting from scratch. If you are remodeling, then most likely it makes sense as a secondary source of heat. It is so nice to step onto what would normally be a cold tile on a snowy winter morning and finding nothing but a toasty warm feeling. If you have a hot air furnace system, you will need to consider one of two options. Either an additional small boiler will need to be installed to use hot water (hydronic) to power your radiant heat or electric heat mat radiant. If you have a boiler already, you will need to make sure that it is large enough to handle the addition of radiant heat. If not, you will need to upgrade the boiler. You may want to consider this anyway if it is old and inefficient. As with the boiler, if you choose to use electric mat radiant, you will need to make sure that your electrical service is adequate to handle adding the additional demand. Although it does not require much power, it is better to be sure not to overtax your electrical system. Within the hydronic (hot water) radiant system, there are two options. The first is tubing that is set in a mortar bed. 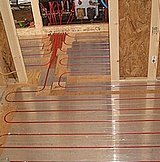 This type of hydronic radiant heat has advantages over panel and mat types as it can be shaped to go around obstructions where the panel type cannot. The second hydronic option is radiant sub-floor panels. In this option, grooved panels made of plywood or composite materials with integral heat transfer plates. The tubing is placed within the shaped grooves. This type gives you a bit more control over the location of the tubing as each panel is manufactured the same. For electric type radiant, thin rubber or fibrous mats have embedded electric resistance cables. Unlike its radiant tube system competitor, the electric mats cannot be cut around obstructions. All is not lost however, most manufactures will customize panels for those needs. This does increase the material purchase costs however. Although all manufacturers supply their mats with waterproof connections, it is suggested that they be connected to a GFCI (ground fault circuit interrupter). This will add more feeling of safety as the circuit will trip at the first sign of a malfunction. Radiant has dropped in cost over the last decade. Once only installed in the homes of the well to do, radiant is being installed in all types of homes for people with all types of means. 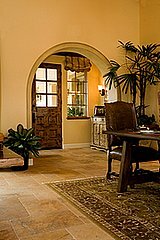 Whether a do-it-yourself project or professionally installed there is something for everyone. That said, there are things to consider when choosing the type of heat desired. If you have the option to choose any of the installation and operating methods, then you should consider all factors. Although the installation of a hydronic radiant floor has more upfront costs, it's operating costs are significantly less than that of it's electrical counterpart. If you are limited to only electric heat mats, you may want to consider having it connected to its own thermostat. This will save on operating costs as the heat in the mats will only come on when the temperature in that space drops below the level set and only run for a certain length of time. Since the heat is not forced through air flow, radiant offers a couple benefits. One is that it does not dry out your skin or your breathing passages like standard heating systems. And add the fact that the air you breathe stays cleaner as there are no added dust or allergens re-circulating in the air it sure makes it a choice to consider. Additionally, heating your body from your feet up, allows you to stay warmer. Although not proven, there are claims from radiant manufacturers that it actually increases your body's circulation. Zoning the radiant gives added flexibility to the system. Whats more, radiant eliminates the need for ductwork, baseboards and floor or wall registers giving additional design flexibility. It allows you to heat only areas being used creating a much more efficient system. Moreover since radiant heats the lower half of the space, it does not waste as much energy as forced hot air which concentrates at the upper half of the room. This could result in a 10-25% cost savings off your utility bill. What once was only used in Europe and the wealthy in other parts, radiant is fast becoming the choice for lots of homeowners around the globe for reasons we have described.